As a child, Aimée Baldwin spent Saturday mornings learning about the wildlife of Tilden Park in its junior ranger program. Now her own wildlife is about to be displayed there. Baldwin, 36, is a Berkeley artist who specializes in what she calls “vegan taxidermy” – extraordinarily lifelike sculptures of birds made by hand from crepe paper, wire and Styrofoam. On Thursday May 10th, her work will be exhibited at the Brazilian Room, in the center of her old Tilden haunts. The one-night show is part of a silent auction and dinner to benefit Golden Gate Audubon Society, the local Audubon chapter covering San Francisco, Berkeley and neighboring communities. “Bird people really appreciate what I do and all the effort I put into making things realistic, versus people who can’t tell the difference,” Baldwin said. Baldwin’s sculptures attest to that effort, a remarkable melding of detailed craftsmanship and love of nature. Baldwin spends about 10 hours on each of her small bird sculptures, and as many as 80 hours on large ones like a great blue heron she is currently completing. Each one of her birds is unique. She starts with a Styrofoam core and bulks it out with wadded newspaper, masking tape and paper maché. Baldwin adds wire for legs, “sculpting goo” for beaks and claws, and glass eyes from taxidermy suppliers, the only part of the entire bird that she doesn’t make by hand. Then she painstakingly paints and cuts high-quality German crepe paper to create the feathers. Before Baldwin ever starts work, though, she studies and makes multiple sketches of her subject. She works from photos, field guides and Internet images – but her preference is to watch birds in the field. 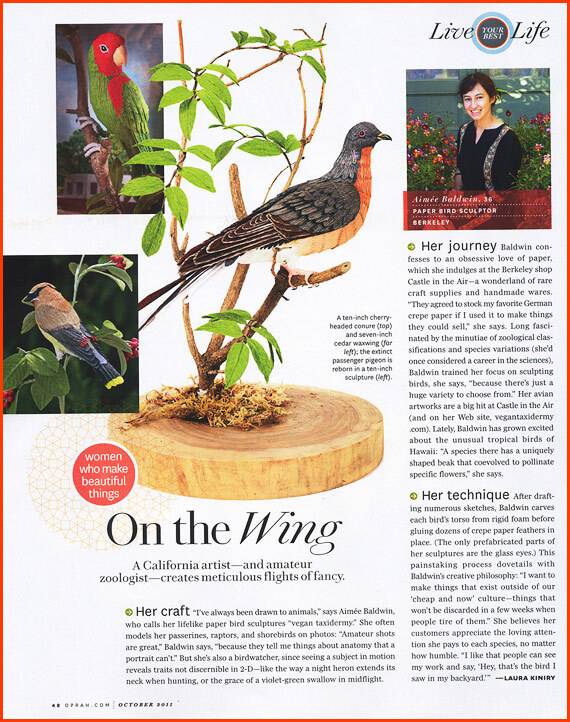 Although she has been creating birds since 1999, Baldwin only recently started attracting a broad audience, with profiles in the San Francisco Chronicle and O magazine during the past year. Her love of nature began as a child in Berkeley, not just during those junior ranger programs, but on family camping trips. Her family also may have provided her artistic launching pad: Her mother studied Decorative Arts at Berkeley and was a weaver, while her father built model airplanes and did occasional sewing projects while she was growing up. Baldwin herself studied computer art at U.C. San Diego, but was turned off by what she refers to as “the baloney of the contemporary conceptual arts world.” She returned to Berkeley after college, held a series of miscellaneous jobs and tried making sculptures out of junk. Then a friend opened Castle in the Air, a shop on Fourth Street focused on eclectic stationery and art supplies. The friend asked Baldwin for help showing customers what they could do with the high-quality German crepe paper used for paper flowers, and Baldwin found her niche. Baldwin loved the texture of the crepe paper, which is thicker than the stuff used to decorate kids’ birthday parties. She started by making flowers and party favors, and looked to Mexican folk art for inspiration. Gradually she shifted into birds. Today Baldwin creates her sculptures on weekends and evenings, after biking home from her day job as a sculptor at Chiodo Art Development in Oakland. She works in the dining room of her home, the 1930s cottage in which her mother grew up. Her birds are for sale at Castle in the Air, on the web (http://www.vegantaxidermy.com and Etsy), and at the occasional nature-oriented show like the upcoming Golden Gate Audubon event. What next? Baldwin would love to collaborate with local groups such as museums or educational institutions. “I have ideas about uses (for my sculptures) other than peculiar house decorations,” she said. And she’s hoping to sculpt a creature that would never be found in today’s Tilden Park. Aimee Baldwin’s bird sculptures will be available for viewing and purchase at Golden Gate Audubon Society’s annual Birdathon dinner on Thursday May 10th at the Brazilian Room, from 6 until 9 pm. Admission to the art exhibit is free but the dinner costs $35. For reservations or information, email lowensvi@goldengateaudubon.org or call (510) 843-2222. Ilana DeBare, a former S.F. Chronicle reporter, is communications director for Golden Gate Audubon Society.